Homepage > The coolest packaging concepts around. The coolest packaging concepts around. Students and design companies like to make concept packaging to show off their skills. Creating a brand image and translating it onto a product, especially a range of products is incredibly difficult. This creative agency, Moon Troops, has done a whole host of concept designs that do that very well. Translating imaginary brands into packaging that would definitely sell to consumers. 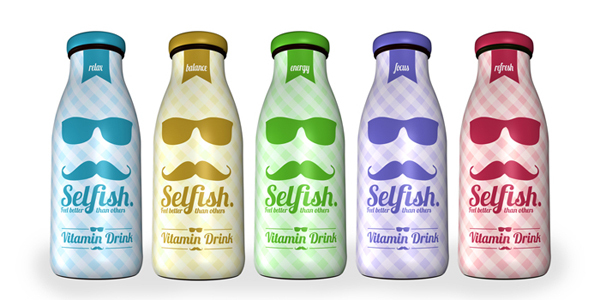 The use of popular culture symbols such as sunglasses and mustaches will go down well with consumers who follow trends or are attracted by humorous packaging. For each different drink product a different colour has been used but the entire design has been kept the same. This should create product/ colour association and keeps the brand coherent across all the products. Another great concept design from Moon Troops is this iced tea packaging. For each different flavour they change the colour of the red drop shown in the image above. Again they have kept the integrity of the brand when designing each product and have made the packaging simple and easy to understand.